No matter what the occasion, our spacious banquet room provides the perfect backdrop for all of your special events. The room can accommodate up to 60 guests, or can be split with a curtain to accommodate two parties of 20 to 30 guests. Our packages offer a variety of high quality, made-to-order Italian specialties sure to please! Our staff will provide a memorable experience for you and your guests! The food and service are outstanding. We have been there many times and everyone's meals have been excellent. My only complaint is the noise level of the restaurant. Sometimes it is so noisy that it can be hard to hold a conversation. We went on Saturday night for a family dinner. The restaurant wasn't that busy but the server was really slow. Also, we ordered 4-5 different types of dish and all the pasta was so dry. I don't think I will visit this location. Loved the Open Table reservation where we reserved our table and got seated immediately! I wish their raviolis are not dry!! They need some sauce. Otherwise great food and wine. Wonderful friendly place. Great Wait staff working hard to please. Love the menu choices and dessert. Six of us! Individual checks. Spencer did a great job with us. Food spectacular. We missed the 1/2 and 1/2 lunch options but all found a great meal. We went at 6pm on a Monday. I definitely expected more for an $18 bowl of pasta (as did the others).It was what I expected from my fast food italian places at $8 a bowl. Others got Chicken marsala and lemon chicken that was a good portion. They may have rated their food experience higher. Good service. Hardly and chicken, mushrooms and little sauce in the rigatoni. Ill try the chicken next time. Prompt and courteous service, delicious food, overall good time for a large party of eight. We have never had a bad time or meal at BRIO's. The service has always been better then expected. Great (and plentiful) food plus pleasant and proficient server. Party of 8 for a birthday, Saturday. Food took too long about an hour and all the food is cold. It’s better than Cheesecake Factory across because of the reservations, but could get better food elsewhere. I enjoyed very much the delicious salmon a la Fresca entré, it was cooked to a perfection and had a beautiful presentation. The service was top notch! We had to send back our meals because they arrived to our table cold. The meals were prepared again but couldn’t complete our meal as a family since we had to return our daughter back to campus. We would not recommend this location for a meal. 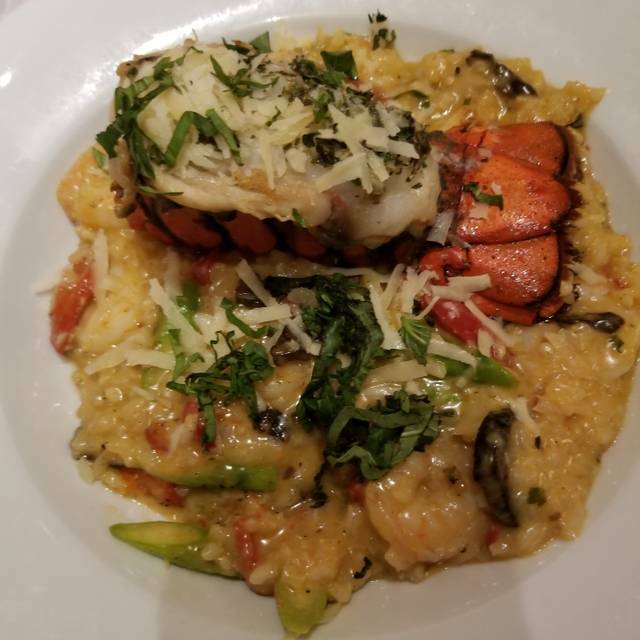 We quite frequently go to Brio and enjoy the food … however, this time we were quite disappointed - one of our dishes seemed to be sitting under the light for a while and the other was not quite to the level we were used to (chicken marsala with the chicken from the grill?!) … we noticed that the restaurant was quite busy with the large groups which may be the reason - that said, that should not be an excuse - and - the service was as great as always! We enjoy going to Brio whenever we go to the malls. On this visit, the food was prepared well and tasted good. We look forward to returning. A delightful experience for my friend and me. Our server Joel was exceptional. He was helpful in choosing our meals, very knowledgeable! My friend had a gorgeous looking salmon meal. She said was delicious. I added the crab cake too. Must said it was the highlight of my meal. I live on the Eastern Shore of the Chesapeake Bay and Brio’s crab cake was the VERY BEST! This Brio is so much more noisy that than the one I've been to in Salt Lake City. The first table they sat us at was extremely noisy because it was separated from the kitchen by a curtain. There was a lot of yelling and banging of pots and pans. When our server arrived to take our drink order -- about 10 minutes after being seated, we asked to be reseated. Once we arrived at our new table -- still extremely loud with the yelling from the kitchen (but not as much banging of the pots and pans) our server came and promptly took our drink order. Then we placed an appetizer order. The appetizer (Spinach Artichoke Dip) came out nice and hot. We placed our dinner order. My husband ordered Salmon and I ordered Chicken Milanese. Both would have likely been quite tasty had they not sat in the kitchen long enough to get cold. By the time our server came to check on us, we'd eaten too much of our meal so though he offered to re-do it, we opted not to do that. The server sent the manager over. She offered to pay for our dessert and gave us a gift card to come another time, which was good customer service. However, the waiter never brought a dessert tray but about 15 minutes later brought our check. So, we're not sure if it didn't get communicated that she was planning on buying us dessert or not. Still up in the air on whether we will return and use that gift card. It was great and the food was spot on. My lady and I enjoyed ourselves. Table ready when we arrived. Food was great! We were seated 45 minutes after our reservation time and people with a reservation after us were seated first. After ordering my entree, I was visited by an employee to let me know they had just run out of my choice. Had we been seated 45 minutes earlier, I probably would have been able to have the meal I wanted. My spouse had lamb that was overdone. It was a disappointment overall. Would not recommend going there on a holiday. Ok experience on Valentines Day. Chip Flat bread was just ok salads were great. We skipped the entrees. It was very busy and very noisy. We had a pleasant experience, although we were seated at our table 45 minutes after our reservation, it was understandable because it was Valentines Day, before we got the table, we enjoyed some delicious cocktails at the bar... all the staff were very friendly. The appetizers and the food excellent! What a bad experience. We have made the reservations but still have to wait for almost an hour to get our sits. The food did not worth the price. Staff is very slow. Bar attenders are not nice at all. We had reservations at 7 on Valentine's Day. We arrived early and sat at the bar for a cocktail. It was extremely busy but the amazing and friendly wait staff handled it very well. We were enjoying it so much we stayed at the bar and gave up our table. While we were at the bar enjoying a fabulous meal, it appeared another customer was unhappy with our bartender. She was loud and extremely rude to him - totally unnecessary. This unruly customer and her male counterpart made a scene demanding the manager. Through it all, the staff remained calm and very professional. We had a great experience because of the staff! Keep up the good work! Family early Valentine’s meal. Kitchen was backed up. Waitress and manager were both nice, but we still didn’t get food until 8:00 (with 6:30 reservation). When it finally arrived, my wife’s pasta was cold. They tried to compensate with free appetizer and glass of wine, but not enough. Since they changed menu there are not many things I can choose from. Price went up dramatically and all good dishes we usually ordered are gone. I had salad with grilled shrimp,shrimp had no tastes at all.It seems like shrimp were sitting in the water for a long time and put them on the grill for a few mins.It was terrible. Maybe they changed hands,I have no idea why they ended up chasing customer away. As for pasta dishes,there are no pasta dishes with red sauce,I don't eat white sauce. In addition to this comment,15.00 for a cup of ordinary wine is very expensive in this area. We go out for dinner every weekend. We had a 6:30 pm reservation and were eventually seated at 7:00. Sigh. The server was a little over friendly (he talked to my husband and me like we were hard of hearing and/or a bit slow... we are not, but he was half our age). I did like that the server didn't tell us he was going to "take care of you" tonight (gag). We were seated at a table near a big post, so I was kind of behind the post which wasn't particularly enjoyable. But we were hungry and had somewhere else to be in an hour so we made do. The menu is not extensive, but you can make healthy choices if that's your desire. The server brought bread and parmesan crusty-somethings with everything seasoning that were scrumptious. I ordered salmon over a bed of spinach, asparagus, and sweet potato, with a pesto vinaigrette and a balsamic glaze. I made some adjustments and all were handled to spec. The salmon was delicious, but I found the whole dish a bit greasy. My husband had the sirloin salad (served cold), and was simply underwhelmed. He also ordered a cucumber mojito which was much too sweet (the menu did not indicate simple syrup as part of the drink), so he sent it back. I think the quality of the food was good. I am willing to give it another chance, so if we come again we'll do it when we are not under time pressure and, perhaps, when we're not watching our calories. Disappointing. The cook did not do what we requested. Too many large tables of noisy families or groups. Very nice waitress but the food was very mediocre. We won’t do that again. 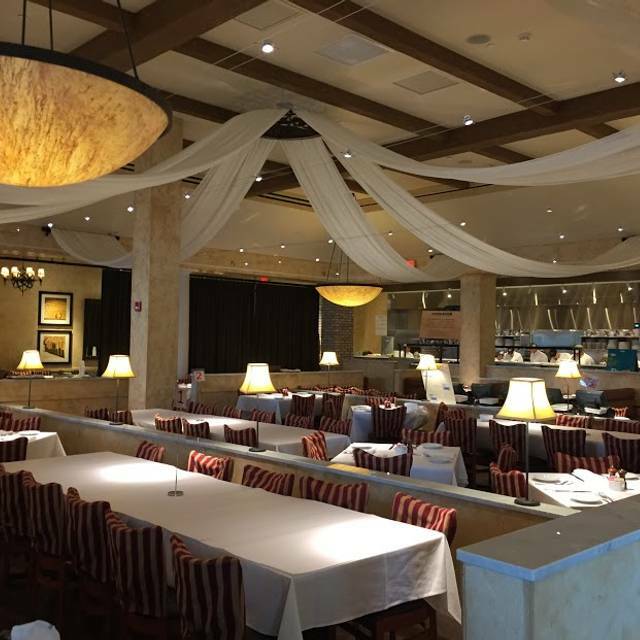 BRIO is a solid option for mall restaurants. The service is usually very good and the value/cost is usually okay. It's not great but it's a nice, well-run operation. It's nice to see the open kitchen. The menu is nice and tight and has a good selection of meat, fish and pasta. It's a solid option when you just want a solid option. We usually enjoy dining at Brio, but this time the service was disappointing. It was pretty crowded, even for a Saturday night, and we felt like we were being rushed through our dinner in order to turn over the table as quickly as possible. That may have been more of an effort on the part of our server rather than the restaurant management, but whatever the case it was annoying. Our appetizer came out so quickly that it was warm instead of hot. My bowl of soup arrived before we had a chance to finish the appetizer and then entrees arrived before I could finish my soup. We were probably done the whole meal in an hour. After dinner we went to the bar and the service there was the opposite, way too slow. Food and drinks were all good, but service was not up to par this time around. Great service, great food, great place. Excellent location and experience.